“In Today’s Economy, Access To Gold Is A Necessity! Simply put, you can use this insider secret to instantly create a “real property” asset that you can use yourself to mine unlimited gold, sell it for a profit, or even lease it to someone else to mine gold for you. In fact, once you figure this out, you’ll be able to tap into hundreds of thousands of the federal government’s “private reserves” of land available right now for you to claim gold mining rights to. What I’m talking about is tapping into the federal government’s seemingly unlimited data banks of public lands for your own profit and personal enjoyment. Myth #1 – I can go out to public lands and take the gold there since they’re ‘public’ already, right? Wrong! Some people mistakenly believe that they can enter any ‘public land’ and mine gold because it’s listed as public land. 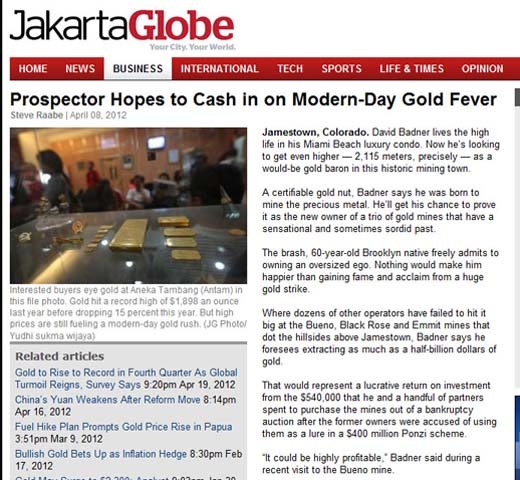 Think again, because if you start mining on someone else’s claim, they have a name for this….claim jumper! The fines are pretty stiff for this. Myth #2 – All the ‘good’ areas for mining gold are already taken. That’s definately not the case. First off, there are hundreds of thousands of acres of federal lands available to be claimed, of which only a fraction are currently being used. The real shocking truth you’ll find out is that thousands of gold mining claims fell back into the hands of the government, because their owners didn’t remember to renew their claim ownership. Not only this, but you can look at these lists of expired claims and take claim to them yourself. Talk about easy! They did all the hard work for you, and you get to swoop in and scoop up this bonanza of mis-handled mining claims. Myth #3 – This can’t be that easy to do. If it were, then everyone would be staking gold mining claims so they could reap the rewards. Not so. There are two very important things to remember here. 1.) Hardly anyone even knows that there are laws on the books that give you this kind of powerful advantage. In addition, the people that DO know about them are in no hurry to tell anyone…that’s not so surprising is it? 2.) Until now, there hasn’t been an easy step-by-step guide to help someone through the process of claiming these gold mining rights. You can mine the gold yourself, and keep everything you recover from the land. You can lease the mining rights to someone else, and get them to pay you a ‘cut’ of what they recover. You can ‘will’ your mining claim to friends or family. Since a mining claim is considered ‘real property’ it can be kept in the family for hundreds of years. I’ve seen some claims that are still owned by the same family as when it was first claimed back in the days of the gold rush. Simply put, when you add all of this up it becomes an incredible opportunity to secure the mining rights to these government lands (hundreds of thousands of acres available) that are just sitting around not being used – all for just pennies — and all yours for the taking! Where do you find out which public lands are open to mining claims? How can you tell if someone already owns the mining rights? Claiming gold mining rights have long been been a secret of either crusty old prospectors or savvy mega-mining corporations. Even though these folks don’t seem too alike, they do have one BIG thing in common…they’ve kept these secrets of claiming gold mining rights all to themselves. In fact, many of these giant businesses have been built and succeed based on getting ahold of these mining rights and then selling them off as they want to cash out. 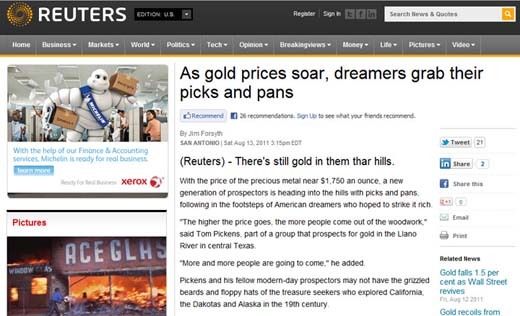 Personally, I’ve seen these companies claim thousands of acres of gold mining rights, then wait until lots of talk about gold hits the news…then turn around and sell them off for a handsome profit. On the other hand, many of the weekend warrior-type prospectors like having their own personal ‘stash’ of claimed land that they can retreat to on the weekends and on vacations to relax, camp out, and get as much gold as they can from their claims. How to find a slew of expired mining claims in 5 minutes or less using an almost unknown online tool! How to determine exactly if an area of land is considered public land and able to be claimed for gold mining. (Especially what designations that the government gives to these lands – this can be a dangerous mine field to navigate if you’re not informed ahead of time…last thing you want is an angry prospector on your hands that doesn’t take too kindly to you jumping his claim). How to tap into the vast “warehouse” of government publications, forms and tools that they make available for citizens just like you and me. Yes, Uncle Sam puts all these things together for us to use, except for one thing…they don’t tell anyone where they have them, or what to do with them. What you need to do with a few pieces of paper on your mining claim to let any other potential gold seekers know that your rights to gold on the land are set aside for you and you only. 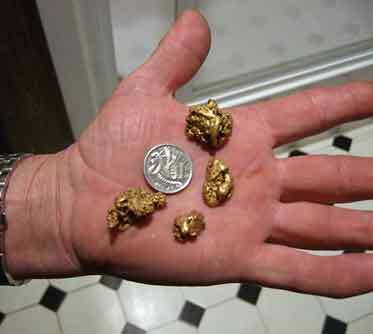 The 3 different ways that you can profitably use gold mining claims. The 2 different types of gold mining claims that you can make. You need to know what they are because the government has different rules for claiming these rights based on which one you plan to do. The secret to retaining your rights to the mining claims after you make them. This one alone can save you hundreds of dollars! Frankly, I’m never going to hold this E-Class again — but the good news is I did have every single part of it converted into a home study course. Now you can have the same “No Holds-Barred” gold mining claim information-treasure trove from that E-Class at your fingertips where you’ll hold the key to unlock the hidden government vault of public land mining claims to profit from and enjoy over and over again. Think about this for a minute: With this knowledge you’ll have the confidence of knowing how to maneuver around the government hurdles and roadbloacks that stand between you and an almost unlimited amount of gold mining claims – while others that may hear about claiming gold mining rights are scrambling and running around in circles trying to figure out this whole process. So What’s All This Going to Cost Me? Honestly, I thought long and hard about delivering this exclusive information only as part of a high-priced seminar where I charged at least $397 per person. But instead of going to all the trouble of arranging a meeting space and taking time out of my schedule – I settled on an Instant Downloadable Home Study Course as a perfect and convenient way to deliver this information (for you and me). That’s why the entire “Gold Mining Claim Secrets” Home Study Guide — instantly available to you by immediate digital download is only $27. Don’t Worry downloading is a snap and it works for both PC and MAC users plus you get all the bonuses listed below! It’s without saying that this guide is jam-packed with the jealously guarded secrets to finding, claiming, and using federal gold mining claims. Truth is, you’ll never find this in-depth information in any ebook, course or manual. But even with that said, just to sweeten the pot a bit I’m also going to hand to you these special bonuses to reward you for taking action immediately. My Promise is VERY simple. if you don’t agree that this is the most impactful, eye-opening, and practical information you’ve ever received on the subject of gold mining claims, simply email me and i’ll issue you a 100% refund on the spot. In fact, I’ll extend this guarantee for 90 days! That’s right, a full 90 days to use and benefit from this unique information or else ask (and receive) an immediate refund. And if you decide to opt for a refund I still want you to keep the 4 bonuses as my free gift just for giving this a shot. I understand that by investing in this Gold Mining Claim guide TODAY, I will receive INSTANT ACCESS to your “Gold Mining Claim Secrets” manual as well as the bonus manuals that will help me get started as quickly and easily as possible.. I also understand that the FREE bonuses that I receive are mine to keep even if I return the system for a full refund. But whatever you choose, don’t let this opportunity slip through your fingers! I urge you to take action right now and grab this material on finding, claiming. and using gold mining claims for fun and profit. Trust me, you won’t want to miss out on this one. PS: Still skeptical? I completely understand. You probably don’t know me, and you’re not sure if this is what you’re looking for. But since you’ve read this far, I know you’re somewhat interested in staking gold mining claims…this could be your chance to finally lay claim to acres of gold rich land. PPS: Even if you cancel and ask for a refund within 90 days, all the downloadble bonuses are yours to keep for your trouble. It’s my way of saying ” thanks for giving it a try”. So even if i refund your $27, you get to keep $60 worth in bonuses. Click to secure your copy now! Disclaimer: I am not an attorney or a professional advisor in any industry. The results described in this website are not typical and will vary based on a variety of factors outside my ultimate control. Your use of any information and/or materials on this website is for pure reference and is entirely at your own risk, for which I cannot be held liable. Your use of this website is at your own risk, and you hereby acknowledge and agree that this website and all its info is supplied “as is”, “with all faults”, and “as available”, including all content, quick start guides, sheets, checklists, step-by-step guides, reference guides, sample filing forms, software, materials, services, functions, and/or information made available thereby. It is your own responsibility to ensure that any products, services or information available in this website meet any of your specific requirements.